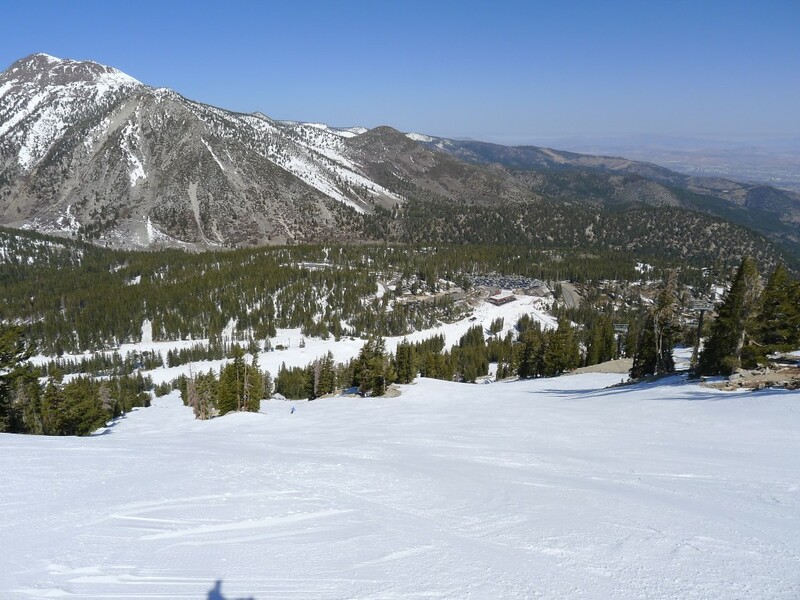 Mt Rose is a locals area for Reno skiers, and is the 2nd of the two Nevada ski resorts we have on our list. Mt. Rose was the last of the Tahoe resorts on our list that we visited. We can’t believe it took us so long, because it is a really fun resort and it has something for everyone. The day we visited it was supposed to be 60-degrees in South Lake, so we decided it would be a great day to get as much altitude as possible. 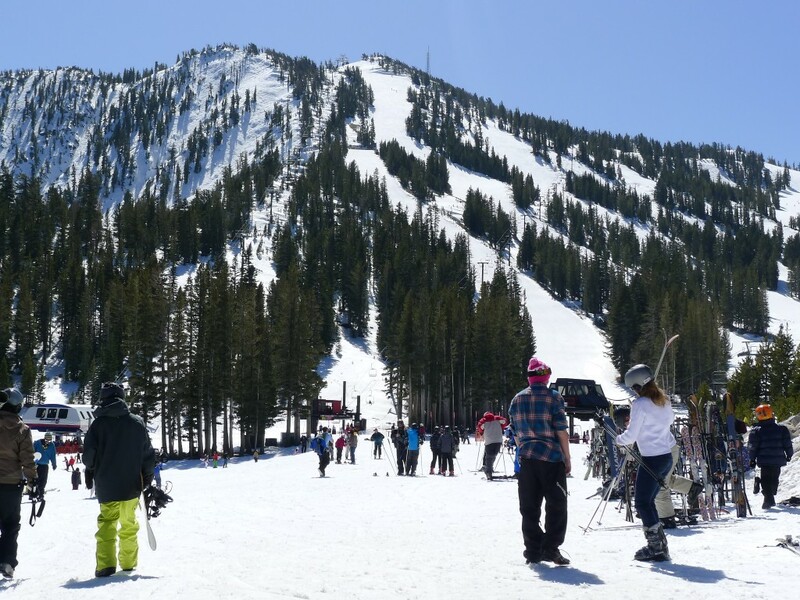 The base area at Rose at 8,260′ is the highest in Tahoe, and is about the same elevation as the top of many other resorts like Homewood or Sugar Bowl. Along with the location on the east side of the basin, the snow stays drier and less icy than many other places. There are 3 ski pods which are on the North and East facing sides of the mountain. On the backside is the old Slide Mountain ski resort which was absorbed into Mt Rose years ago. It has it’s own parking lot and base lodge, but the front and back sides are connected at the top and it’s easy to ski from one side to the other. I’ve never seen this before, but the owners did something really smart when they replaced the old lifts with 2 high-speed 6-pack lifts that together serve the 2 major ski pods and can handle lots of people. 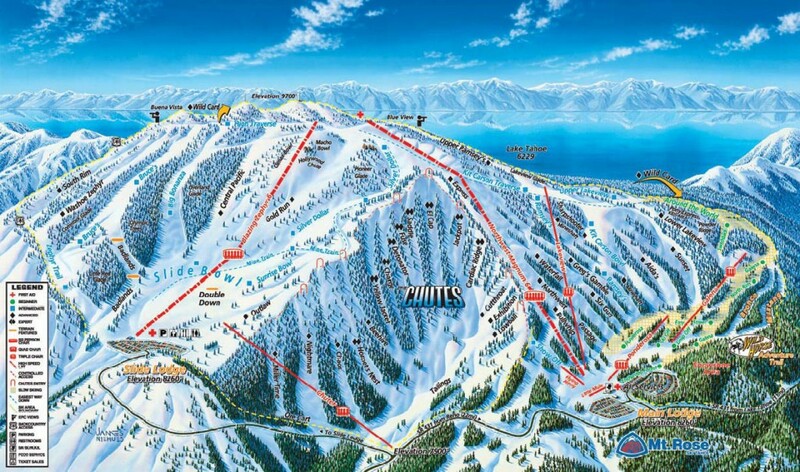 These are the only 2 lifts you need to ride all day unless you are a beginner or want to ski “The Chutes”. “The Chutes” pod is a very steep area with numerous skiable avalanche chutes. The day we were there it was almost unskiable due to the freeze/thaw cycle and the extremely north-facing shady aspect. It was softening by 2PM, but we were ready to head out by then. Still, by reputation we know that this is some of the best steep skiing in the Tahoe region. The Slide Mountain side has 3 groomed blue runs and some steeper bump / tree terrain. It’s best to start on Slide in the morning because this gets sun first. They were having a beer tasting event and live band at the base lodge there, which made for a festive spring atmosphere. 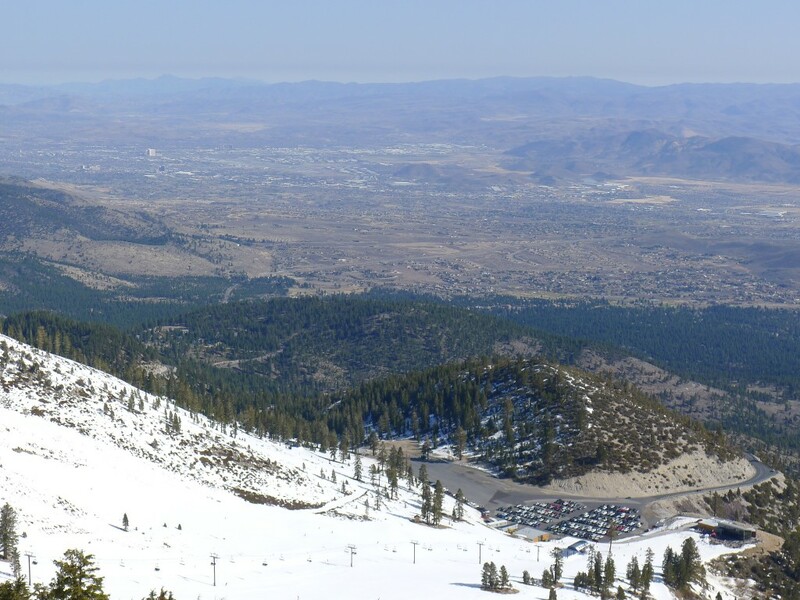 The views of Reno and the surrounding desert are great. The Mt. Rose side has some of the best steep groomers in Tahoe. They face due north and are consistent pitches from top to bottom. It’s easy to take these for granted, but we watched someone crash at the top and slide at super high speed all the way to the bottom. Pretty scary. There are also some mellower blue terrain which gets progressively easier the farther west you go. At the bottom is the usual collection of beginner runs. We found both customers and employees to be very friendly. Parking is very convenient with a very short walk from your car to the lodge. Lift ticket price is lower than average and they frequently have special offers on their web site. 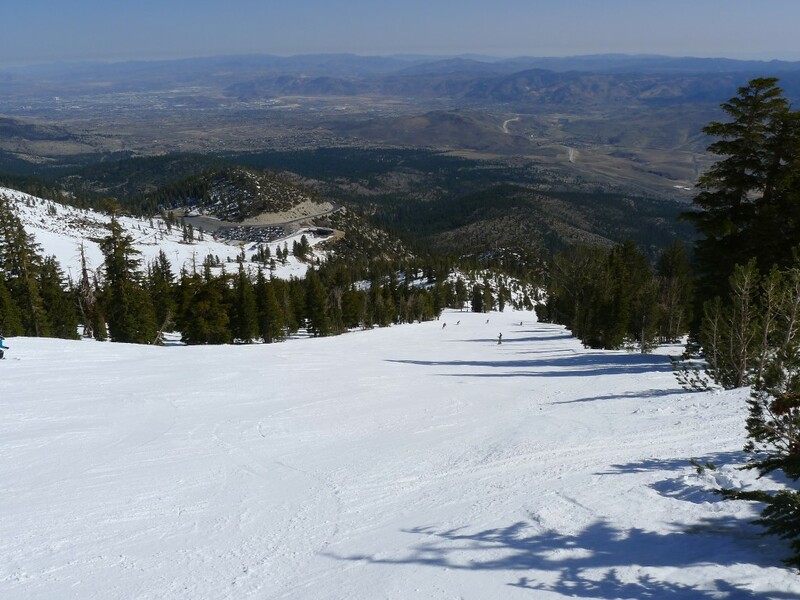 Because of its location on the eastern side of the Lake Tahoe basin, snowfall is less at Mt. Rose than most of the other Tahoe resorts. We were there in a low snow year and the snow line was right at the bottom of the resort. It’s fairly exposed and prone to wind shutdowns just like Heavenly is. The 2 main ski pods have adequate vertical at 1,500 ft, but it does get a little boring after a few hours. Definitely. 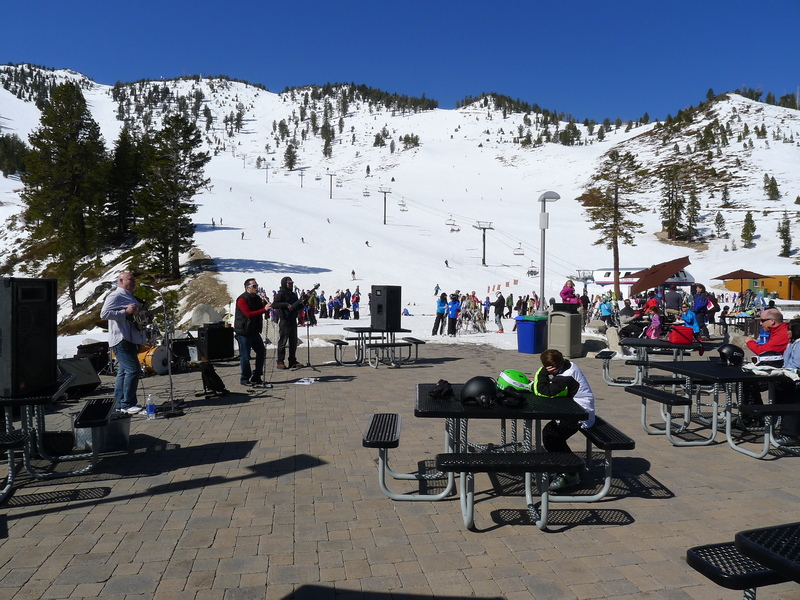 We rate Mt Rose as a solid “3” and would love to go back when conditions favor altitude.